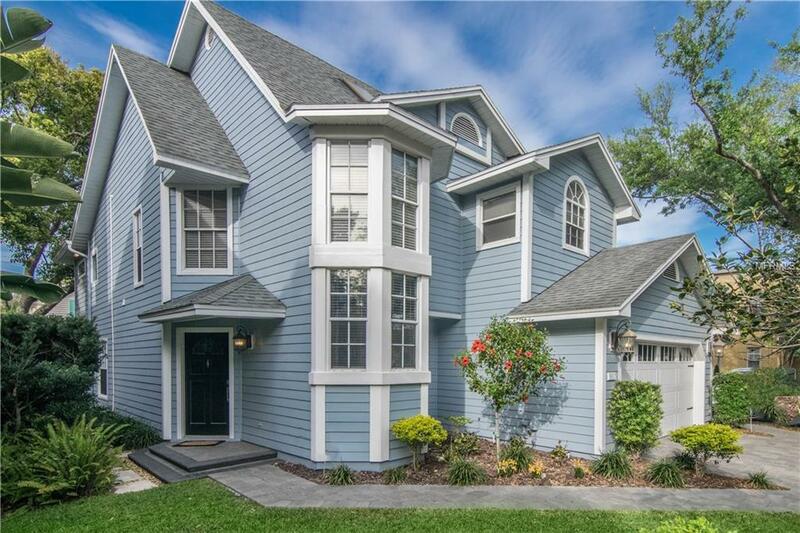 South Tampa living at its best, in the heart of Palma Ceia! This captivating 3-story, 3-4 bedroom, 2.5 bathroom home has a 2-car garage and expansive outdoor entertaining area, with a unique design blending traditional and modern elements. Enter through the expansive foyer that leads to an open kitchen and family room. The updated kitchen is complete with wood cabinetry, built-in wine refrigerator, stainless appliances, granite counters, banquette dinette and large island. Separate formal dining and living rooms open through French doors to the covered lanai and remodeled backyard with travertine, custom designed outdoor kitchen and stone fire pit, plus sizable grass yard inside private fenced yard. The second floor features a large master bedroom with cathedral ceiling and en suite bathroom with marble counter-tops, dual sinks, jetted spa tub, shower and large walk-in closet. Two additional bedrooms on the second floor open via French doors to large playroom/den with vaulted ceiling. Ascend the dramatic spiral staircase to the third floor office/bonus room which can be a 4th bedroom. This designer-inspired home features hardwood floors, wainscoting, crown molding, wood burning fireplace with decorative stone, driveway and sidewalk pavers (2014), landscaped yard, water softener (2015), Trane A/C unit (2017), water heater (2015), surround sound and stylish hurricane-proof garage door (2017). This immaculate home is walkable to top-rated schools, great restaurants and beautiful Bayshore Blvd!